These Biohazard Goggles have an industrial look that is perfect for Steampunk cosplay. 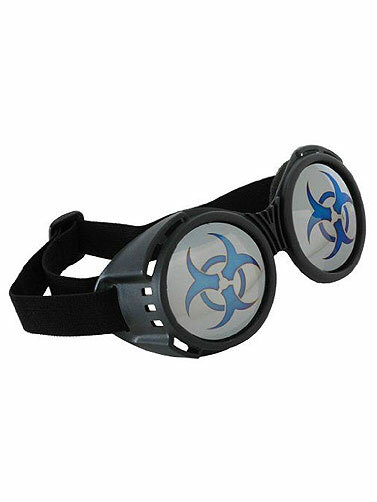 Mirrored lenses feature a blue biohazard symbol on each. Black plastic frame has side vents to allow the heat to escape on a hot day. Padded foam on inside of frame allows for a more comfortable fit. Offers UV 400 protection. Features an elastic size adjuster for the best fit. Biohazard Goggles are one size fits most; adults and kids 12 and up.